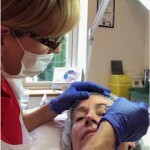 If you are a regular reader of this magazine, you may recall that over the last several months I have been receiving aesthetic treatments from experienced Aesthetic Therapist Gillian Huntley of appearances, who will be celebrating 30 years in the industry next year and has specialised in Advanced Aesthetics for more than 15 of those. 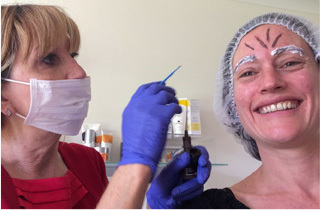 Although her own clinic is in Chisleurst, she treats many of her local clients (many as a result from these features) at Options Beauty Salon here in Edenbridge. The treatment I am having done for this issue is the most transforming yet, so I did take some time to think about it. The treatment? Eyebrow tattooing or “WoW Brows” as Gillian has nicknamed them. 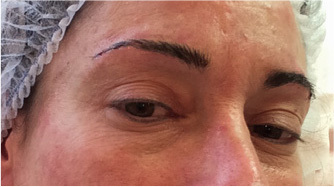 There may be a number of reasons why you would possibly consider having your eyebrows tattooed such as: over plucking, cancer treatments resulting in loss of hair, pale brow hairs or simply to redefine the shape of what you currently have. 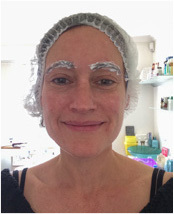 The first part of the treatment is to decide upon the shape of your new brows and this is no quick process – in fact more than half the time I spent with Gillian (about an hour) was simply getting the shape right before anything else could start. 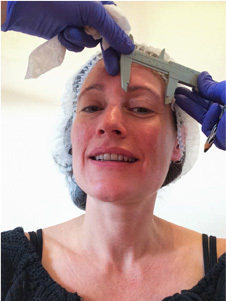 Gillian uses a special measuring device to make sure they are the same size although, she said, “Eyebrows should never be twins, they should be sisters.” – as more often than not our faces are not symmetrical so it would be almost impossible to have them identical anyway! In order that I could have a better visual as to how they could potentially look Gillian used a light pencil to go over the hairs that would be removed. Once agreed, the next step was to select the most suitable colour, the closest match to my natural brow hair and which would also work with my hair colour. Having created so many WoW Brows over the years Gillian has a keen eye to matching colours for her clients so the end results looks as natural as possible. Once I was happy with the shape, I then had the numbing cream applied so the process wouldn’t hurt. I may have looked a bit like an Ooompa Loompa but from my previous treatments I know this cream is fantastic at reducing any pain that might otherwise be felt. Next Gillian removed the stray hairs from around my eyebrows (although not touching the whited out part at this stage in case I changed my mind). 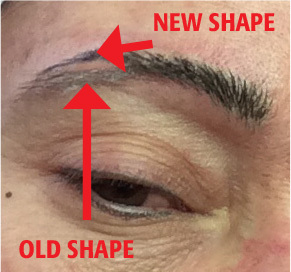 After that she began tattooing the fine hair strokes onto my brows and gradually I could see the new, more defined shape forming. 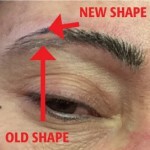 One of the final things she did was pluck out the hairs that had formed part of my original eyebrow. So what does it feel like? Well, thanks to the effects of the numbing cream all I could feel was an uncomfortable sensation but no pain. 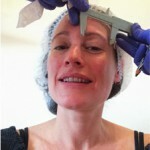 A couple of times throughout the process Gillian reapplied the numbing cream to one side while she worked on the other side. 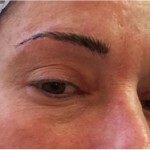 There was a redness around my eyebrows following the treatment which was to be expected but it soon went down. The healing process is very straightforward. Gillian runs through the do’s and don’ts and gives you a sachet of vitamin A & D ointment to help the healing process. 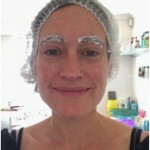 After about 4 days the scabs which had formed over my eyebrows had disappeared and the only telltale sign was a few dry skin patches across my brow so I continued to apply the ointment for another couple of days. You can see how they look in the before and after pictures below. I feel like I have been given an eye-lift! I will require a touch-up appointment in one month to ensure full evenness of colour and I can’t wait – this must be my favourite treatment so far! 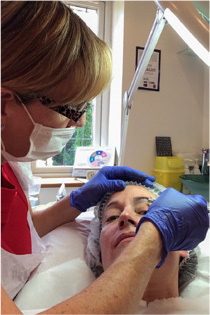 If you would like to arrange a consultation with Gillian or book an appointment for WoW Brows or any other of the treatments she offers, call her on 07711 067 789 or email her at appearances4u@me.com. Gillian is delighted to announce that she is a finalist in the Kent Health & Beauty Awards 2015! Good luck Gillian!